Whatever quibbles one may have about Settle's avowedly singular interpretation of these two classic Sophocolean dramas should not detract from her remarkable achievement in bringing together excellent national designers, a high level of acting craft and two major new translations by Nicholas Rudall, without the support of any of our major established theatres. Antigone, of course, makes the best sense right after one has seen Oedipus the King, because it allows us to directly explore the source of the cursed daughter's stubbornness and familial malaise. 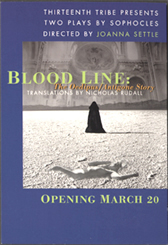 In typically adroit fashion, Rudall has crafted two theatrically workable new translations. Although free of anachronisms and jarring colloquialisms, they nonetheless seem fresh and alive. Settle has filled her raw performance space with gravel and scenic towers, and the cavernous performance area allows for very complex and dimensional stage pictures and chorus movement dimensional stage pictures and chorus movement that is often thrilling in its scale and dexterity. Although James Stanley's Oedipus and especially Anne DeAcetis' Antigone are strong, the main reason to see this show is the ensemble-driven directorial conception rather than the individual performances. There are moments, such as when a microphone drops from the ceiling, that the show seems a bit too much like Akalaitis redux. And Mark Ulrich's Creon is so lacking in tragic stature that his appalling fate does not entirely sustain our interest. But Settle apparently is not so much interested in the political, societal dimension of these plays than their psychological and personal implications. It's a valid choice and this is an involving and exciting-work from a very talented young director.